After the hype of the last few days, which raised questions as to how long the present government might remain in power, as well as the ratification of the Prespes agreement by Athens, Prime Minister Alexis Tsipras and his right-wing coalition partner Panos Kammenos have in essence agreed to a mutually convenient path which will not threaten either. The coalition that has governed Greece for the past four years, made up of leftist SYRIZA and right-wing Independent Greeks (ANEL), came to an end after Kammenos, the leader of Independent Greeks who was also the country’s defense minister, left the government due to his opposition to Athens’s deal with the Former Yugoslav Republic of Macedonia (FYROM) aimed at bringing an end to the dispute over the latter’s name. That move left the PM short of a majority in Parliament. In a deal that was announced on Sunday, which came as no surprise, the SYRIZA government will remain in power, with a renewed mandate, despite being criticized for the way this new majority is being formed. SYRIZA itself has 145 deputies, and can count on the positive votes of Deputy Citizens’ Protection Minister Katerina Papacosta, To Potami MP Spyros Danellis, as well as four ANEL deputies, Tourism Minister Elena Kountoura, Deputy Agriculture Minister Vassilis Kokkalis, Thanassis Papachristopoulos and Costas Zouraris. They add up to the 151 needed for a simple majority in the 300-member Parliament. Danellis came under increased pressure on Monday from his own party as well as pundits to rethink his publicly expressed position in favor of the government, but he seemed unwilling to change his stance. Only Kammenos and Deputy Defense Minister Maria Kollia-Tsaroucha resigned their cabinet posts. Hence, the math is there for the government to pass the confidence vote, which will take place on Wednesday. That is also the prevailing feeling among investors who seem relatively confident that Tsipras can win. Even if he loses, the Greek Constitution allows him to remain in power, although many believe that in that case he might opt for calling early elections instead of continuing to the end of his mandate in October. 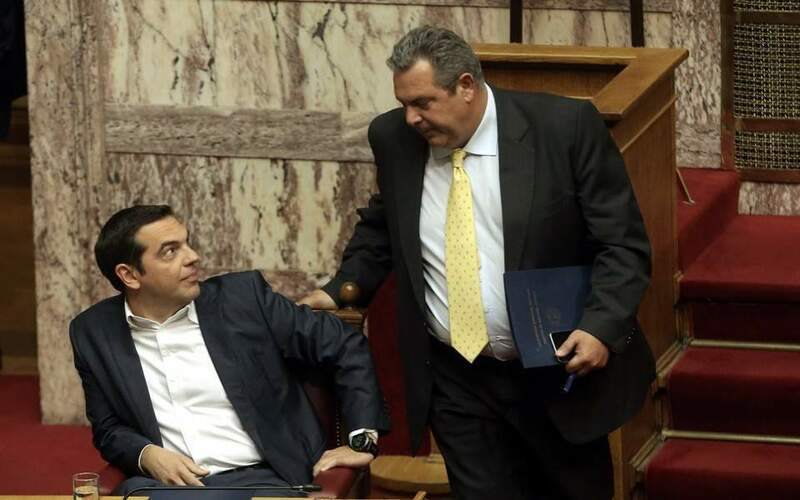 At the same time, the agreement between the Greek premier and his outgoing coalition partner indirectly but clearly makes the passage of the Prespes agreement in the Greek Parliament almost certain. FYROM Prime Minister Zoran Zaev on Saturday called on Greek lawmakers to ratify the Prespes accord – a day after Skopje’s Parliament approved the constitutional amendments required under the deal with Greece. It seems his call will be answered. Tsipras has decided to see the Prespes process through to the end, in an effort to show the European Union and the United States that he has evolved into a realistic and credible partner. As already mentioned, SYRIZA has 145 votes, and if one adds to those the expected votes in favor from Kountoura and Papacosta, as well as those of To Potami MPs Danellis, Stavros Theodorakis, Spyros Lykoudis and Giorgos Mavrotas, and ANEL MP Papachristopoulos, we end up again with a majority, in this case of 152. There might be one more, that of Democratic Left chief Thanasis Theocharopoulos. In addition, the main center-left party, Movement for Change, in essence the former PASOK, announced on Monday that although the official party line is against the Prespes deal, its deputies can vote whichever way they feel, a move that could further increase the majority in support of the agreement with FYROM. In any case, the government will stay on, and will get the Prespes agreement passed, to the relief of Greece’s transatlantic partners and allies who have invested a lot in its implementation. A final footnote: The whole setup allows Kammenos, although not a minister anymore – he will be replaced by the chief of the Hellenic National Defense General Staff, Admiral Evangelos Apostolakis – to remain the leader of a party that despite its diminishing presence will still constitute a parliamentary group (at least five deputies are required for one to exist, and Independent Greeks is now down from seven to five). Thus he will be able to enjoy the institutional benefits that come with it. That way Kammenos and his party will continue to have higher exposure in the public debate, which could help them in their uphill effort to survive politically and enter Parliament in the next national elections, whenever they may take place.